Kalanchoe plants provide beautiful spring blossoms to add color and vitality to your indoor sunny windows. Give the kalanchoe plant enough water and light, and it will thrive for years in the same container. Watch the growth of the plant to know when the kalanchoe outgrows its current container. When the container becomes too snug for the kalanchoe’s root system, repot the kalanchoe in the spring before the beginning of the next growing season. Check the kalanchoe plant in the early spring to see how much growing room the plant has in its container. Gently invert the container and pull the plant from the container. If you find little soil between the outside perimeter of the roots and the inside edge of the container, with the roots growing to within 1/2 inch of the container, repot the kalanchoe. Fill the bottom of the larger container with 2 inches of gravel for drainage. Add enough potting soil to fill the container approximately halfway. 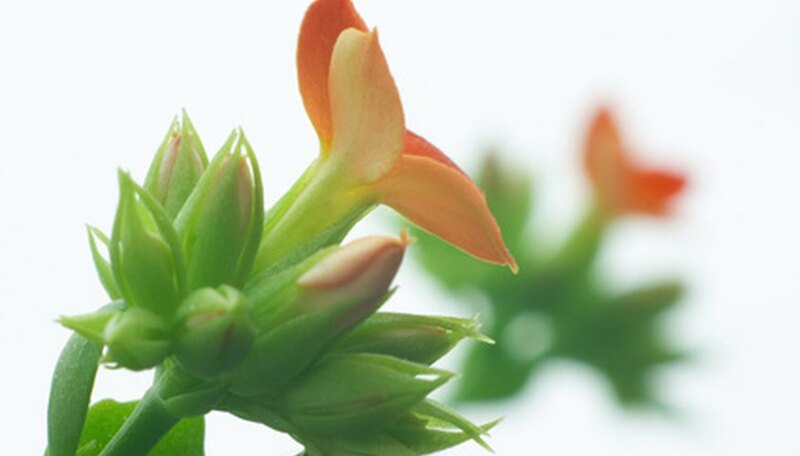 Remove the kalanchoe plant from its current container, and transfer it to the larger container. Situate the plant so the crown is just below the top of the container. Add potting soil in around the roots to fill the container to the top and cover the roots up to the crown of the plant. Firm the soil down lightly with your fingers. Provide water for the newly repotted kalanchoe plant immediately after you transplant it, moistening the soil evenly. Place the kalanchoe plant into a location that receives a minimum of four hours of sunlight. Keep the soil evenly moist by providing water when the top 2 inches of potting soil dries out.